Yech. One-time Tea Party favorite Marco Rubio reveals his true colors, confirming he would grant permanent amnesty to DACA (Deferred Action for Childhood Arrivals) illegals imported by Obama. The chief spokesman for the presidential campaign of Sen. Marco Rubio (R-FL) said in an on-record interview with Breitbart News that the senator, if elected president, would not require a secured border before he gives legislative and permanent amnesty to recipients of President Barack Obama’s first executive amnesty, the Deferred Action for Childhood Arrivals (DACA) program. “No,” Alex Conant said when asked if the border would need to be secured before a President Rubio’s legislative amnesty for recipients of Obama’s 2012 DACA would replace that executive amnesty. Rubio intends to, if elected to the White House—as he laid out in a Spanish-language interview with Univision’s Jorge Ramos this weekend and was subsequently confirmed by Conant—eventually undo DACA. But he would not do so until there is a legislative replacement that provides the legal status—or amnesty—to DACA recipients on a permanent basis. Conant argued that Rubio’s belief that it’s okay to grant the amnesty to so-called DREAMers—people who came to the United States as minors illegally “through no fault of their own”—before the border is secured is something he has always believed. Conant points to a bill Rubio was working on in 2012 to do just that—a bill that was upended when Obama moved forward with DACA without consulting Congress. What Obama did in 2012 was—as Rubio was working on legislation to deal with those who came here illegally as minors, as were some others in Congress on both sides of the aisle—announce unexpectedly through executive action that he would unilaterally grant those people legal status, work permits, Social Security cards, and other benefits. DACA is not just deportation relief; it includes benefits tied to a legal status in addition to deportation relief. “One of the key distinguishing points here is that DACA is not deportation relief. It’s benefits in addition to that. It’s work permits, Social Security cards–” Breitbart News said in the interview with Conant, according to part of the transcript. “Well, it’s not Social Security cards,” Conant replied. “Well there’s a whole bunch of things that come with DACA—it’s a legal status,” Breitbart News followed up. “It’s a legal status, yeah—a temporary legal status,” Conant replied. Conant later, via email, admitted when presented with a document from the Social Security Administration that he was incorrect—and that yes, in fact, illegal aliens provided with DACA do get access to Social Security cards. Those on the left—and some in the political establishment right—like to claim that if DACA status is revoked for those who have received that executive amnesty from Obama, then that means they will be deported. But in this interview with Breitbart News, Conant admitted that pulling such status does not mean that such people will be deported. “But they’re not going to be deported… There are what, anywhere from 11 to 20 million people in this country right now that are being deported that don’t have legal status?” Breitbart News asked in response. “Well, they’re all subject to being deported,” Conant answered. “Of course, but that doesn’t mean they’re going to be deported—that’s a whole different other issue and a different step,” Breitbart News followed up. Sens. Ted Cruz (R-TX) and Rand Paul (R-KY), two other declared GOP presidential candidates, and Louisiana Gov. Bobby Jindal, a likely 2016 GOP presidential candidate, have each said in interviews with Breitbart News that one of their first acts as president will be to reverse all of Obama’s unconstitutional and illegal executive actions and orders. That includes DACA. In doing so, they would technically be revoking the temporary legal status that Obama has—illegally, and outside the purview of Congress—provided to about 800,000 illegal aliens through DACA. They would each presumably seek legislative pathways forward to secure the border and handle reforms to the immigration system—just as Rubio says he wants to do—and the order by which each would do so is something that will be explored as the process for 2016 plays itself out. 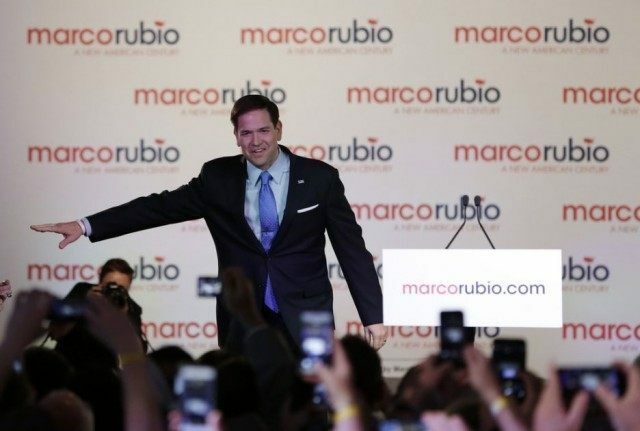 Rubio’s previous support for a comprehensive immigration reform package—like the Gang of Eight bill for which he was the lead sponsor—something he’s touted even as a presidential candidate when compared to former Secretary of State Hillary Clinton on immigration, but has since backed down from in favor of a piecemeal set of reforms indicates that he previously supported doing all the different steps of immigration matters at once. Typically, immigration reform steps are broken into several matters: border security, interior enforcement, putting together a different legal immigration system than what is in place now, and dealing with people who came to the United States illegally. The key differences between politicians—how voters can tell the difference between the people they are considering voting for—comes down with how each of these things would be done, some key policy differences in the various steps, and in what order the steps would be handled in the legislative process and administrative implementation of them. Everyone—even congressional Democrats like future likely Senate Democratic leader Sen. Chuck Schumer (D-NY), one of Rubio’s partners in the Gang of Eight bill process—says they support border security and interior enforcement. Several conservatives, however, argue the only way to ensure that border security and interior enforcement with real teeth actually happens is that those steps are passed legislatively, then implemented by whatever administration is in power—and that implementation is verified before other steps of immigration reform are taken. When it comes to the second step, dealing with the legal immigration system, there are vast differences between different politicians. Generally, politicians in Washington support—in large part because most special interest groups like Big Business and Big Labor—a massive increase in foreign workers being brought to the United States. Then there are some differences at the last step, when it comes to dealing with people here illegally, in that some politicians support granting them legal status and others a pathway to citizenship—both technically being an “amnesty” because the person who committed the crime of illegally immigrating to the United States wouldn’t face the penalty on the books for doing so: deportation. Sometimes they’d face a different, alternative penalty—depending on the plan—but that’s not the point. To secure the border and engage in interior enforcement first, before even considering the next step, would take a very long time—practically speaking—if whoever is elected president next follows the Constitution to do so. Passing substantive legislation through Congress, with all its various committees and amendment processes and markups and votes, would take months if not a full year. After that, implementing that administratively and effectively ensuring the border is secured may take another full year, maybe more. At this point, any president doing this process is about two years, maybe more, into their first term in the presidency. After that, doing the legal immigration process would take another, perhaps even longer, amount of time—especially with as many special interests trying to get a bite at the apple as Washington does its work—and by then, assuming whichever president started this is re-elected, the nation would presumably be in the next president’s second term. Then, and only then, would most Republicans—according to what they’ve said—be dealing with the people who are here illegally and presumably, if the Democrats hold up their end of the bargain and let the border be secured, interior enforcement and fixes to the legal immigration policy be implemented, would any Republican president deal with any legalization or citizenship matters for those here illegally. That, for most Republicans, includes legislation dealing with recipients of Obama’s DACA and other so-called DREAMers. With Cruz, Paul, and Jindal—in fact—each would actually revoke that legal status provided to DACA recipients until presumably this point in the game is reached, meaning those people would again rightly be classified as illegal aliens. That, again, doesn’t mean they would be deported—it just means they wouldn’t be granted an executive amnesty. Holding back on granting such an amnesty to those people until everything else in place, conservatives and most Republicans argue, allows them to ensure and verify the correct reforms are implemented by a political class uninterested in implementing such reforms—thereby avoiding the conundrum that history, with Ronald Reagan’s 1986 amnesty that never saw real border security or interior enforcement despite promises of both, has proven exists and flourishes. Rubio, according to Conant’s interview with Breitbart News, would do this drastically differently. First off, the senator would, if elected president, allow those illegal aliens who have received DACA executive amnesty to keep it until a legislative replacement comes for that. “So he’s always said we should figure out a way to accommodate those kids,” Conant told Breitbart News. “And as you’ll recall, in 2012, he was working on legislation—in Spring and early Summer of 2012, he was working on legislation—that would give these kids legal status and while we were working on the legislation is when the president without consulting us and as far as I know anyone in Congress issued DACA killing the legislative efforts. “You can go back and look—I encourage you to do so—go back and look at our statement in June of 2012 when the president did it. We basically said we don’t want to deport these kids, we want to figure out a way to accommodate them. But doing it via executive order is the wrong way to do it in part because it isn’t a permanent solution it is just a temporary solution that future presidents would have to renew and that the kids themselves would have to renew. You know, this is not a permanent solution. What we need is a legislative solution and that’s what Marco has continued advocating. “So you’re saying that what the other guys want to do is give them ‘de facto amnesty’? Not give them legal status, but not really do anything about them being here,” Conant said. The term “de facto amnesty” was one Rubio used frequently throughout the Gang of Eight debate. What he essentially means by it is that illegal aliens who do not have the authority to be in this country—but aren’t being deported—are in limbo, and the problem does not get solved. What many conservatives argue needs to be done is that limbo status—or that illegal status those people are in—needs to be the bargaining chip that Republicans use with Democrats to ensure that there is a secure border and an immigration policy that serves the national interest. They argue that since Democrats only care about the legal status, the only way to force them to do what’s right is to hold that out until the end of the negotiating process. During the course of the interview with Conant, Breitbart News verified each of these positions—especially the belief that Rubio is okay with granting a legislative amnesty to DACA recipients before the border is secured—multiple times. “But the point being is that he would not require the border to be secured before a legislative solution for DACA was passed?” Breitbart News asked Conant again after he confirmed the first time that Rubio believes that. “Okay, that’s the key point I wanted to drill down on—which is that ‘would he require the border being secured [before the legislative solution for DACA]’ and the answer is obviously no. He would make that a priority obviously—securing the border—but—“ Breitbart News asked again, just to be sure. Conant did confirm, however, that Rubio’s position is that the only legislative amnesty that is okay before the border is secured is one that replaces the executive amnesty for DACA recipients. Only DACA recipients, he said, would be eligible for it. “But the point is his legislative solution would only deal with the kids who already have legal status not the kids who came in the border crisis last summer? Not any future ones that come between now and then?” Breitbart News asked Conant. “The legislative solution would only deal with the kids who got DACA status?” Breitbart News followed up. “And after that, would any other person get any legal status before the border is secured who hasn’t been given a legal status through DACA?” Breitbart News asked again, just to be sure. “No, he’s said we need to do the border security stuff first,” Conant said. 2016, amnesty, border, DACA, DREAMer, election, Gov. Bobby Jindal (R-LA), Gov. Jeb Bush, Legal Immigrants For America, LIFA, Sen. Marco Rubio (R-FL), Sen. Rand Paul (R-KY), Sen. Ted Cruz (R-TX), undocumented. Bookmark.